To Margrethe Bakke on the "Ships starting with B" page. Delivered in July-1938 from A/B Götaverken, Gothenburg as Margrethe Bakke to D/S A/S Golden Gate (Knut Knutsen O.A.S. ), Haugesund, 5478 gt, 3280 net, 8420 tdwt, 453.2' x 58.8' x 26.0', 6-cyl. 2 tdv Götaverken B&W, 6900 bhp, 16 knots. Guestbook message from the son of someone who was on board in 1943. On my Memorials page, which has a section naming some Norwegians buried at Saranac Lake, there's a John Otto Svendsen. According to "Våre falne", a series of 4 books naming Norwegian WW II casualties, he served as ordinary seaman on Margrethe Bakke until he contracted tuberculosis in the winter of 1942 and was sent to a sanatorium. Died at Saranac Lake on Febr. 4-1943. July 3 Liverpool   OB 178 For Panama. 1941 Jan. 7 Bombay Colombo  Independent Page 1 gives arrival Jan. 10. June 21 Calcutta Colombo June 23* Independent *Page 2 gives arrival June 25. Sept. 28 Durban Bombay Oct. 3* Independent *Page 2 gives arrival Oct. 9. July 13 Philadelphia Baltimore  Independent Page 2 gives arrival July 14. Jan. 25 Hampton Roads Port Said Febr. 21 UGS 31 For Port Said. Oct. 22 Port Said Baltimore Nov. 18 GUS 56 Port Said to USA. Apr. 16 Southend New York City Apr. 27 UC 64A Convoy will be added. Dec. 27 Arica Valparaiso Dec. 29 Independent Via Tocopila. From Page 1 of the archive documents, we learn that she was on her way from Chile to Norway in the spring of 1940, but was diverted to the U.K. (Norway was invaded on Apr. 9, and on that date she was en route from Antofagasta to Callao). Via various other ports she headed to Halifax, and with a cargo of copper and fruit for Liverpool, she joined Convoy HX 40 from there on May 4 (having been cancelled from the previous convoy on Apr. 30, HX 39). She arrived Liverpool on May 18, Manchester the next day, later continuing to Ellesmere Port and Eastham. In July she's listed in Convoy OB 178, which left Liverpool on July 3 and dispersed on the 7th. Her destination is given as Panama, and as can be seen when following the external link provided in the Voyage Record, the Norwegian Austvard, Benjamin Franklin, Hellen, Ingerfem, Senta and Skrim are also listed in this convoy. According to the archive document, Margrethe Bakke arrived Cristobal on July 17, proceeding to New Orleans 2 days later. Her subsequent voyages are listed on the archive document already referred to; her 1941 voyages also start on that page, while the rest are shown on Page 2, which also has her 1942 voyages. It'll be noticed that she spent several weeks in New York, where she had arrived from St. John, N.B. on Dec. 31-1941. Departure date is given as Febr. 13-1942, when she proceeded to Trinidad. On June 1-1942, she rescued the 25 survivors from the American Alcoa Shipper and landed them in New York on June 2 (7 had died). Going back to Page 2 above, we see that Margrethe Bakke was on her way from Cape Town to New York at the time. Alcoa Shipper had been sunk by U-404 on May 30 - ref. external link at the end of this page for more details on this attack. Margrethe Bakke left New York again on June 28 in order to return to Cape Town, but put in at Philadelphia on July 4 - according to A. Hague she was damaged, but further details are not available. She later proceeded to Baltimore, where she arrived July 14, and there's now another long gap in her voyages; she did not leave again until Oct. 4, with arrival Durban Oct. 30, continuing to Bombay the next day. Skipping now to Nov./Dec.-1943, when we find her in Convoy MKF 26 (this is a little confusing, because the original document that I've used for my information on the page about this convoy, which had the U.K. as its destination, makes it look like she joined from Oran). She was the only Norwegian ship - follow the link for names of others taking part. Margrethe Bakke was not bound for the U.K. on that occasion; she had started out from Port Said and according to A. Hague, she was detached from the convoy on Dec. 2. From Page 3 of the archive documents, we learn that she arrived New York on Dec. 12, having also stopped at Augusta Nov. 21/Nov. 27. In Jan.-1944 she shows up in Convoy UGS 31, departing Hampton Roads on Jan. 25, arriving Port Said (Margrethe Bakke's destination) on Febr. 21. The Norwegian Audun, Dux, Granville, Katy, Nueva Granada, Solør and Strinda are also listed, but note that they were not all present from the U.S. In May that year she's listed as bound from Alexandria to the U.S. in Convoy GUS 39, which originated in Port Said on May 4 and arrived Hampton Roads on the 29th. (Dux, Ida Bakke, Liss, Meline, Norelg, Polarsol, Thorshavn and Tijuca are also included, but they were not all bound for the U.S., nor had they all been present from Port Said). Going back to the archive document referred to above, we see that she arrived New York on May 28, having sailed from Alexandria on May 5. In Oct.-1944 she appears in Convoy GUS 56, leaving Port Said on Oct. 22, arriving Hampton Roads on Nov. 19; Margrethe Bakke arrived Baltimore the day before, remaining there for about a month. Her voyages in this period are shown on Page 4. Other Norwegian ships in this convoy were Buccinum, Egda, Evita, Fenris, Fernbrook, Gallia and Kong Sverre - all these convoys are available via the external links provided in the table above. In March-1945 she sailed in the fast eastbound North Atlantic Convoy CU 62 from New York, together with Finnmark, Hegra, Karsten Wang and Martin Bakke, returning to the U.S. the following month with the westbound Convoy UC 64A*, which left Liverpool on Apr. 16 and arrived New York on the 28th. That's where VE Day was celebrated, before she headed back to the U.K. on May 10 in Convoy CU 69, arriving Liverpool on May 20. As will be seen when going back to Page 4, she got to go home to Norway in Oct.-1945, making another voyage home the following month - see Page 5, which shows her voyages up to and including most of Apr.-1946. * Convoy UC 64A will be added to an individual page in my Convoys section in due course; in the meantime, please see the page listing ships in all UC convoys. Collided on Febr. 22-1954 with the French Capitaine St. Martin off Folkstone and was badly damaged. Caught on fire on Febr. 20-1956 while repairing at Kieler Howaldtswerke. Laid up in Haugesund Nov. 25-1969. Sold that same month to I/S Margrethe (Torvald Klaveness), Oslo as Margrethe. In the Concordia Line in 1970 as Concordia Margrethe. 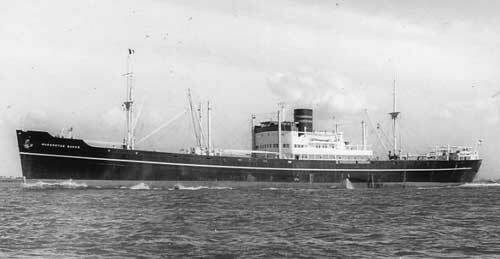 Sold in June-1970 to Iokasti Shipping Co. Ltd., Cyprus as Iokasti of Famagusta. Laid up at Piræus July 31-1976. Arrived Split, Yugoslavia for breaking up on March 11-1977. Stavern commemoration - This able seaman, Arnt Thorbjørnsen, is said to have died at sea on Aug. 2-1941 following illness, and is commemorated at this Memorial for Seamen in Stavern, Norway. According to Page 2 of the archive documents, Margrethe Bakke arrived New York from Trinidad on that date. Knutsen OAS Shipping today - Includes a brief history of the company, as well as a fleet list. Back to Margrethe Bakke on the "Ships starting with B" page. The text on this page was compiled with the help of: "Nortraships flåte", J. R. Hegland, "Våre motorskip" by Leif M. Bjørkelund and E. H. Kongshavn, and misc.